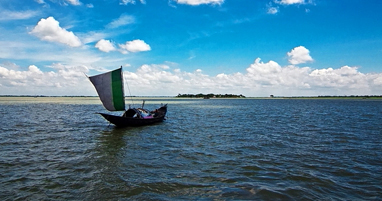 Bangladesh Meteorological Department (BMD) on Thursday issued warning for the country's 18 river ports asking to hoist signal number one. The inland river port warning has been issued for Rajshahi, Rangpur, Pabna, Bogura, Tangail, Mymensingh, Dhaka, Faridpur, Jashore, Kushtia, Khulna, Barishal, Patuakhali, Noakhali, Cumilla, Chattogram, Cox's bazar and Sylhet, according to a BMD massage released on Thursday morning. Rain or thundershowers accompanied with temporary West or North-Westerly gusty or squally wind speed 45-60 kph is likely to occur in many places over the country in the next 12 hours commencing 6 pm today, the message said.